MONTREAL—Quebec's forestry industry has seen regular, predictable slumps (recent downturns happened in 1974, 1982-3, and 1991-4), each accompanied by a round of layoffs in the province’s mill towns and forestry sector. Between the softwood lumber crisis in 2000 and the US housing collapse of 2006, 26,000 millworkers and loggers have lost their livelihoods. In one corner of Quebec, communities have used a cooperative business model to defy the boom-bust cycles and short-term thinking that characterize much of the forestry sector. For tourists, as well as for many urban Quebecers, the province’s effective eastern boundary lies at Tadoussac. Beyond here, on the north side of the St. Lawrence, extends a rugged territory where snow squalls in October are frequent, communities are sparse, and the expense of transport can make commerce difficult. Returns on investment are often modest, and in the days before the provincial government re-ordered and centralized the economy in the 1960s, locally-owned cooperatives brought electricity as well as grocery stores to many a North Shore town where private entrepreneurs did not see enough of a profit opportunity to attract their interest. Sacre-Coeur, with a population of 2000, located fifteen kilometers from Tadoussac, is in most ways a typical North Shore community. The town depended on forestry for several generations, but by 1984, in the wake of one of the cyclical slumps, the local sawmill had undergone its third consecutive bankruptcy in ten years under three separate managements, and seemed set to close for good. Ultimately the facility, which constituted the town's main industry, was to remain shuttered for two and a half years. The town’s residents might have given in to fatalism; but instead, after the bank that held the mill's mortgage was unable to find a buyer and offered to sell the plant at liquidation prices, locals decided to undertake a ground-breaking initiative. Banding together to form the Sacre-Coeur Development Corporation [Societe d'Exploitation de Sacre-Coeur], they secured the support of a credit union as well as a provincial government subsidy, and bought the mill for $1.2 million. According to those who know the local history, the motive in doing this was to forestall the flight of young people to the city and the slow death which is the bane of so many single-resource communities in unfavourable times. After studying various models, the interested parties decided to constitute themselves as a single company called Boisaco Inc, owned in three equal parts by a loggers' cooperative, (Cofor) a millworkers' cooperative (Unisaco), and a consortium of local businesses. An advantage of this structure, according to Marc Gilbert, who was one of the project’s founders and until recently served as company president, is that it allows the workers, as majority shareholders, to benefit from the management experience of the members of the business consortium. Gilbert says that decision-making is rarely adversarial. "We adopted a shareholder's charter that gave everyone [all three parties] a veto right on all big decisions," says Gilbert. "This forced us [to seek] a working consensus." The model is superior to what typically prevails on shop floors, says Gilbert, where management squares off with unions and the need to explain (or debate) procedures slows down productivity. 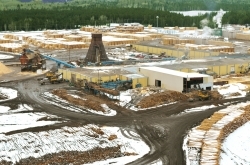 Three months after its reopening in 1985, the combined advantages of a market recovery and the new management allowed the Boisaco sawmill to generate enough revenue to pay off all its debts. Since then, the company has divided profit according to a formula that would seem out of place in the corporate world. Twenty-seven per cent is shared equally as dividends among the three shareholders; eighteen per cent goes to workers' bonuses, while fifty-five per cent (an unusually high proportion, according to Gilbert) is targeted—once taxes have been paid—to research and development. Part of this fifty-five per cent is also allocated to a rainy-day fund. Sarah Toulouse, a recent Masters graduate in cooperative management from the University of Sherbrooke, has studied Boisaco. I asked her why the consortium of business shareholders would agree to finance Boisaco when they could have obtained a higher return on their investment elsewhere. Today, Boisaco provides employment to about two hundred workers as members of one of the two founding co-ops. Moreover, over the last twenty-five years as Boisaco has thrived, it has used part of its profits to acquire shares in diverse companies in the region with which it has then signed supply contracts. In one such case, Boisaco provides lumber to Sacopan, a one-hundred-worker company founded in 1999 that operates out of the same lot as Boisaco in Sacré-Coeur. Sacopan sells fibrewood doorskins within Canada and to the USA. In the wake of the American subprime crisis, Sacpan's sales have helped keep Boisaco afloat. “Historically, whenever [home] construction flags, [home] renovation takes up the slack,” says Gilbert, explaining a strong American niche market for the product. Once the affiliated companies like Sacopan are factored in, Boisaco can be said to secure employment for six hundred forestry sector workers throughout the Upper North Shore. It is source of pride to the company that it has come through the forestry crisis, now seen to be ending, without a high level of debt, and that it accepted a deficit situation rather than shut temporarily or resort to lay-offs. And from conversation it is clear that the management sees this decision as rooted both in sound business sense as well as in Boisaco’s original social mandate. Chris Scott is a Montreal-based writer, researcher and activist who makes regular visits to eastern Quebec.